Little Luke shouts from the sideline, “That’s my daddy!” CeCe Jefferson smiles, gives him a wave and goes back to work. Jefferson didn’t live the life of a normal college athlete in his four years at Florida. 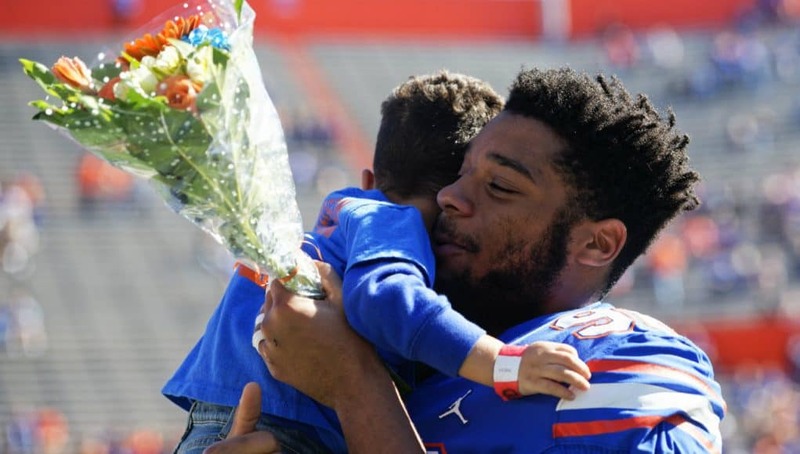 Before he ever played a snap for the Gators, he became a father to a baby boy who simply adores him. And the feeling is mutual. As a young parent, Jefferson wanted to give Luke the world, but he didn’t exactly have the financial means to do that. He remembers taking Luke to the store and him begging for a new toy. He had to take a look in his wallet and tell him to just wait a little longer for him to save up enough money to buy it. When things got tough in the weight room or in the classroom or on the field throughout his career, Jefferson thought of his family. His son and his girlfriend were the only reason he needed to keep pushing. As long as everything goes his way in a few weeks, Luke can have every toy he wants. Every night spent away from his family working toward this NFL dream will finally come to fruition. 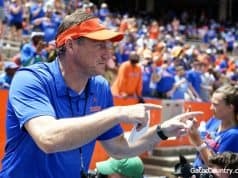 Jefferson has always had the drive to provide for his family, but Dan Mullen, Nick Savage and the rest of Florida’s coaching staff might have given him that small push he needed to stay on track. He could have taken a chance and left for the NFL after his junior year, but he bought what Mullen was selling and chose to stick it out one more season. It didn’t start out the way he envisioned as he missed the first two games of his senior campaign due to some academic issues, but the coaches pushed him to get into tutoring and take it seriously. Once he did that, he essentially lived in the Hawkins Center when he wasn’t on the football field. And on the field, he became even more of a leader. 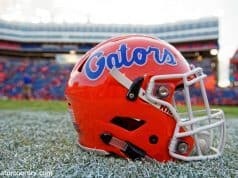 In just a couple months away from Florida’s strength and conditioning program, Jefferson put on unwanted weight. When they announced his weight as 267 at the Combine last month, it shocked him. He didn’t even feel like himself during his workouts. Since then, he’s worked to get back to a good size (260) and redeem himself at Florida’s Pro Day. He performed much better on Wednesday and felt he helped himself out. Now, all that’s left to do is hear his name called, sign that contract, buy Luke a few toys and a nice house to play with them in and continue playing the game he loves. 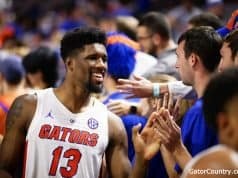 Jefferson’s time at Florida may be up, but while he’s off fulfilling his lifelong dream, he thinks the Gators will be doing big things, too.